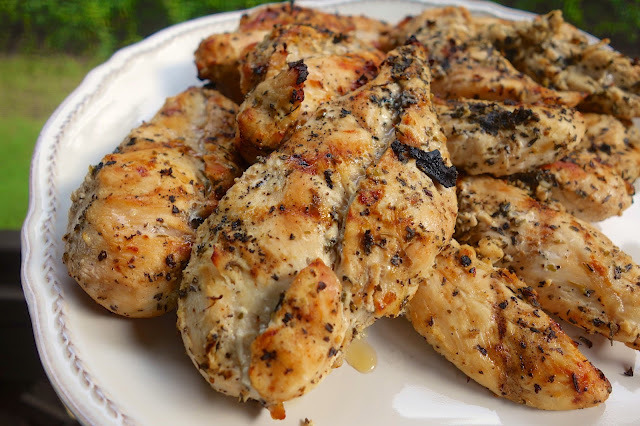 Garlic Beer Marinated Chicken Recipe - chicken marinated in beer, lemon juice, Italian seasonings and garlic - SO good. Let the chicken marinated overnight for tons of amazing flavor. Grill for 12-15 minutes - so easy! I still had some beer in the fridge from the Beer-B-Q chicken we made for Labor Day, so I decided to try another beer marinated chicken. I made this marinade an Italian marinade with lots of garlic and Italian seasoning. My favorite flavors! I let the chicken marinate overnight to get maximum flavor in the chicken. 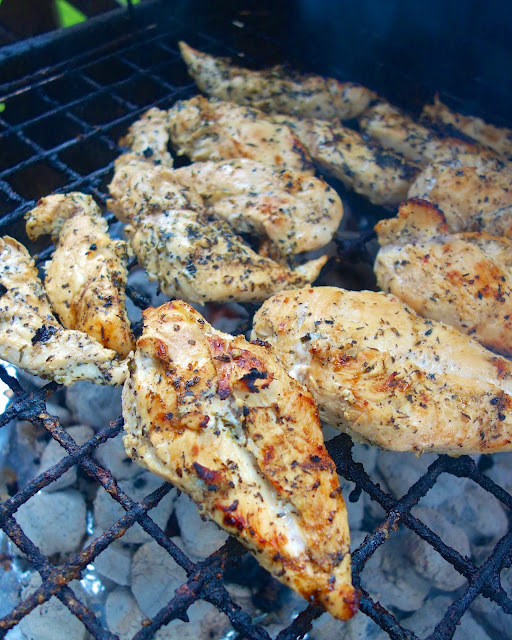 A quick tip on grilling chicken - pound the chicken to an even thickness before marinating. It really helps the chicken cook evenly and not dry out. As you can see, we grilled a lot of chicken. We ate it for lunch all week. It was super yummy! It was really juicy and packed full of flavor. We both gave this chicken two thumbs up! Whisk together beer, lemon juice, olive oil, Italian seasoning, garlic, salt, pepper and cayenne. Pour over chicken and refrigerate a few hours up to overnight. Remove chicken from marinade and grill until done, approximately 12-15 minutes. Sounds like a real winner! I love your tip about pounding the breasts to an even thickness too. Hi..fyi..u have 12 oz. of beer on this posting, and 2 oz. posted on your printable recipe.. Which one is it? Lynne - it is 12oz. the 1 got missed when I copied it over. I corrected it. This sound delish!! What type of beer did you use? We will probably use the bone-in chicken. I'm sure that would be ok, huh? Tricia - I use whatever is in the fridge. I've used Michelob Ultra and Abita Amber. I think bone in chicken will work fine. You will just have to cook it longer than the boneless. This sounds so good, one problem though, we live in an apartment and can't have a grill. Is this something I can do in the oven or a frying pan? LiveLaughLove - you can cook the chicken in the skillet and/or oven. I like to cook the chicken a few minutes on each side and finish it off in the oven at 400 degrees for 10 minutes. If I want to do this with 3 chicken breast vs a whole chicken, how would you adjust the recipe? Never have enough chicken recipes. It's so budget friendly and versatile. This recipe is simple yet very delicious. It gives the chicken such wonderful flavor, and it came out nice and juicy. Kids and hubby approved!